Snow is falling hard Tuesday morning across Minnesota, closing or delaying some schools and roughing up the morning commute. Anoka-Hennepin, Minnesota's largest school district, announced early Tuesday that classes were canceled because of unplowed roads and sidewalks. Rochester Public Schools decided late Monday to call off Tuesday classes. But Minneapolis Public Schools said it would be open, while acknowledging there would be some delays in getting students to school. National Weather Service meteorologist Mike Griesinger said the snow is coming down at the rate of nearly an inch an hour. "We'll probably see some light snow around all the way to the evening rush, but the rates like we're seeing right now, will probably be done by noon," he said. "We've been doing pretty much three-quarters of an inch an hour. Once we get to noon, we're expecting snowfall rates to fall off to maybe a quarter-inch an hour at best." The Minnesota Department of Transportation is reporting roads covered with ice and snow throughout the state. This storm is expected to dump 2 to 5 inches of snow in the Twin Cities, while southeastern Minnesota could get between 6 and 10 inches. It's been so snowy this month that we've now cracked the top 10 snowiest Februarys on record in the Twin Cities. We'll continue to move on up on the list. 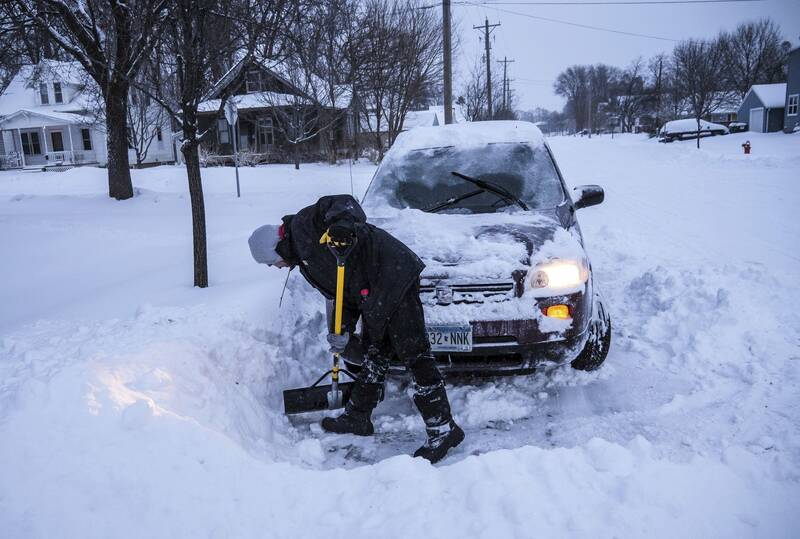 Forecasters say another storm system on Thursday could deliver another few inches of snow.